This is a one-of-a-kind archtop with a glued-on bridge, X bracing, bridgeplate, and circle-of-sound bracing. Ebony fingerboard, floating pickguard and headstock veneer. My arch-top design results in both great dynamic range and a broad palette of tonal color. The piano-like attack combined with tremendous sustain is the jazz guitarist's dream. It permits the player to exploit all the resources of the instrument in ways that have not previously been possible. It has always been my intention to construct guitars that are capable of outperforming instruments that are currently on the market. My guitars are especially appreciated by musicians who perform with other instruments - sax, drums, upright bass and pianos. It is in these situations where a clear leading voice is of prime importance. The tone of your playing can be rich and varied, tender without being lush, and incisive without being harsh. You can bring an audience to tears or bring them to their feet. 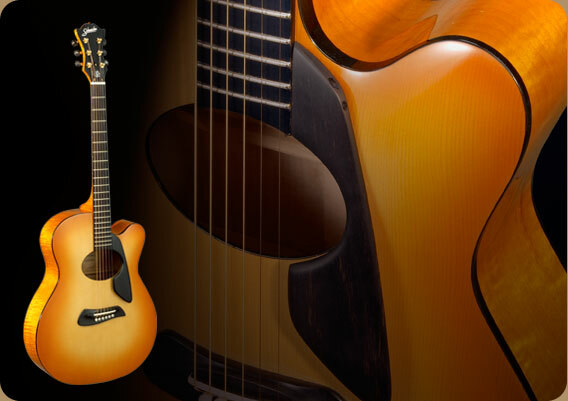 In addition to creating a strong solo instrument, this unique archtop guitar has amazed musicians and collectors who have played it. The sound is a cross between a flat top and an archtop. Players have compared it favorably with D'Aquisto's later hand-made instruments. "I cannot express my gratitude and my satisfaction with this instrument. You read my mind and my soul. The selection of the woods, the shaping, and the electronics all contribute to the playability and tailoring of the instrument to my style and my desired tonality. You created a being that speaks to my soul and allows me to speak through it. From the parts that compose it, it became part of what I do and what I am."